Have You Met the Jackfruit? If you’ve ever traveled through Southeast Asia, you’ve likely seen these huge green, bumpy and spiked fruits at local farm stands. 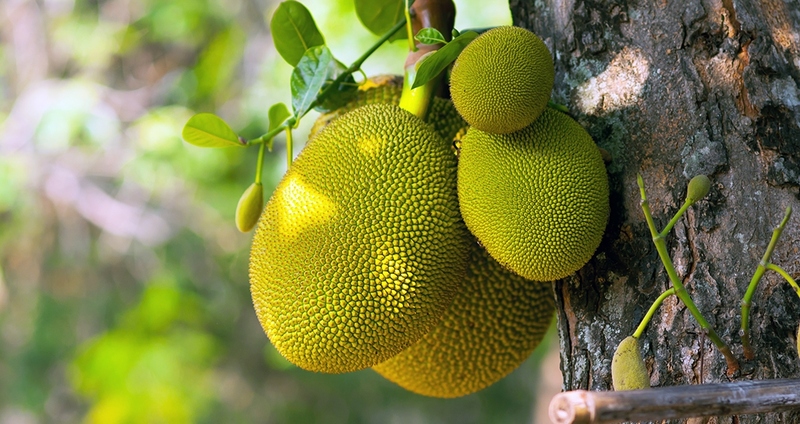 Jackfruit belongs to the same family as mulberries, figs and breadfruit. Despite its massive size, you’ll often smell jackfruit even before you see it. It’s got a very strong odor—a weird combo of rotten onion, banana, pineapple and even bubble gum! But the smell can be misleading, as jackfruit’s taste is mild and delicious, especially when spiced, baked or sautéed. It does take a good amount of prep work to get to the edible flesh and seeds of this delicious, nutrient-dense food. Luckily you can now find ready-to-eat canned or packaged jackfruit on the shelves of many US grocery stores. Like both fruit and starchy vegetables, jackfruit provides carbohydrate, vitamins and minerals. Although jackfruit does not contain protein, and can’t be used as a true meat replacement, you can swap jackfruit for meat to make a great vegetarian barbeque dish, for example. Just add in some hemp or pumpkin seeds for a bit of plant protein. Jackfruit is a good source of vitamin C, magnesium, potassium and manganese. Vitamin C not only supports a healthy immune system but also enhances iron absorption; so pairing jackfruit with hemp seeds is a great way to improve the absorption of hemp’s iron, thanks to jackfruit’s vitamin C. Magnesium is nature’s muscle relaxant, helping the body turn off its stress response and promoting better digestion. Potassium plays an important role in blood pressure regulation and better hydration by bringing water and, as such, water-soluble nutrients into the cells. Manganese helps support healthy bones and metabolism of key nutrients like carbs, proteins and fats. So, yes, jackfruit is not only delicious, it is also a better nutrition choice to help get in key nutrients! From curries and chips to popsicles and roasted seeds, there are so many ways to enjoy jackfruit. Go greens wrap: Add jackfruit to cilantro, garlic, mango and avocado, and wrap in chard or broccoli leaves. Jackfruit curry: Use in place of meat or tofu alongside coconut milk, ginger, onion, curry powder and bay leaves. Top with hemp seeds. Lettuce cups: Fill lettuce leaves with jackfruit, carrots, mushrooms, peanuts, red cabbage, cilantro and ginger. Top a salad: Add jackfruit to tomatoes, avocado, cucumber, quinoa, mint, coriander, garlic, ginger and cashews. Top with a sesame-lime dressing. Mini plant burgers: Combine jackfruit, black beans or quinoa, cashew cheese, mushrooms, garlic and onion to make veggie burgers. Stir-fries: Add jackfruit to broccoli, asparagus, brown rice, green onion, shrimp and sesame seeds. BBQ pulled-jackfruit sandwich: Combine jackfruit with garlic, onion, chili powder and cumin. Serve on a bun with tomatoes, lettuce, avocado and hemp or pumpkin seeds. Frozen dessert: Blend with coconut or nut milk and freeze into an ice cream or popsicle.